Scientific Radio Systems SR-204 Front Panel & Chassis Frame. This was the beginning of the assembly process for building a 100 watt, 1.6 to 30 MHz, 6 channel crystal controlled transceiver. Their beginning is your avenue to high power from your home brew or kit QRP rig to a professional looking rig. All the hard part of homebrewing is done. Just mount your board(s) in the frame and make interconnections to the front panel controls and rear panel connectors. Matching set of knobs included. Included on the front panel are the controls, switches, jacks and a lighted 0 - 1 mA meter marked in "S" units and watts. 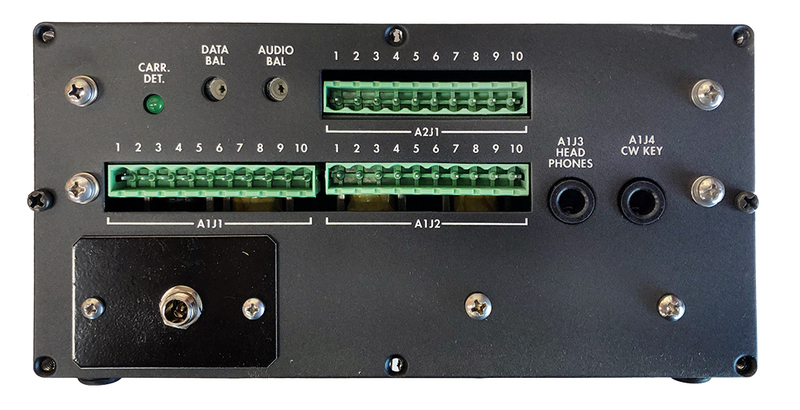 An ancillary board for setting individual transmit audio levels for each channel is mounted and includes six 10k ohm trimpots and miscellaneous parts. 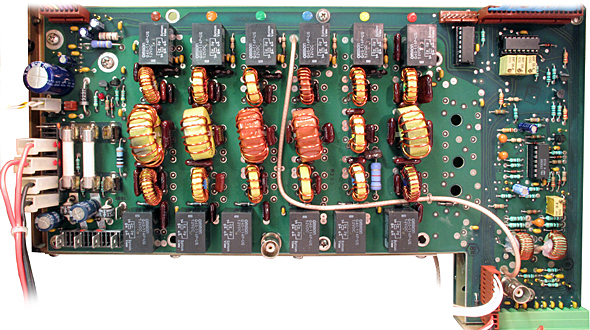 The complete receive audio board that takes output from the detector and boosts it to up to 6 watts out into the 4 ohm speaker is also mounted on the front panel and is included. No more headphones only listening. Also on this board are the transmit tone oscillator for tune up of an SSB transmitter, 2 matching line inputs from 600 ohm balanced feeds, one for transmit audio, the other for receive audio and the T/R relay driver. Also in this frame is the majority of the high power RF deck. This deck was designed to use two 6LQ6 sweep tubes (not included) driven by an MJE340. The MJE340 was driven by a 2N1613 from another board (not included) which is a general purpose 1/2 to 3 watt transitor All parts for the RF deck are included except: two 6LQ6 tubes, 4PDT, 12 vdc, T/R relay and the tank circuit (coil and variable capacitors). It also includes a calibrated RF sampler used to drive the front panel meter through existing wiring on the chassis. The front panel channel switch extends though the RF compartment and could be used to select pre-tuned tank circuit taps and capacitors. The switch is a 7 pole, 12 position switch with 3 poles in the RF compartment and 4 in the front panel compartment. An alternative is to remove the channel switch for a single band radio and mount the frequency tuning control in its place. 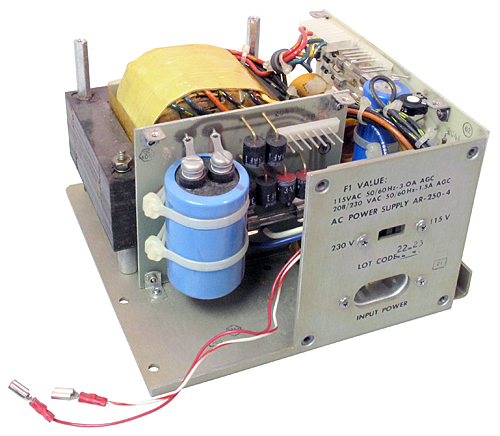 In the original design, this radio included the power supply in the frame to provide all required voltages from either 115 / 230 vac or 12 vdc. If you want to use the 6LQ6 finals, buy the optional power supply of your choice below. Or, gut the RF deck and install you own solid state PA - no power supply needed. A 3-5/8" externally mounted square fan is required for high power operation. A suitable unit is listed on our MUFFIN FANS page. Ventilated bottom cover included. No top covers available. A full manual for the SR-204 is included with each unit. Select from the SR-204 which has a gray silk screened front panel with handles or the SR-204D (below) which is olive drab with no handles. Internally they are the same. 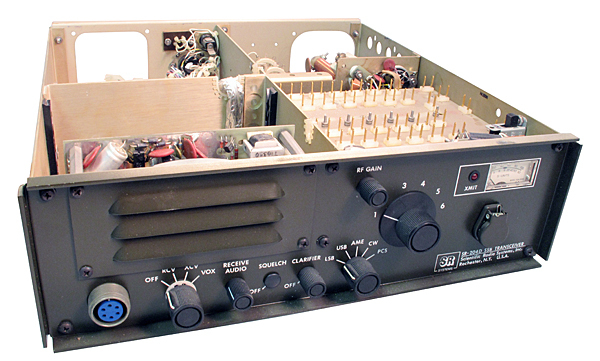 Power Supply section: 6-1/4" x 6-1/4"
Receiver Section: 4" x 6-1/4"
PA Compartment: 6-1/4" x 6"
Exciter Section: 4" x 5"
Scientific Radio Systems SR-204 Front Panel & Chassis Frame same as above except olive drab color. No covers available. Scientific Radio Systems SR-105 beacon transmitter. 115 vac or 12 vdc. 200 KHz - 535 KHz, 100w CW, 300w MCW. Diode programmable CWID & CW speed. Optional alarm signal transmission for 5 internal faults and 2 external. Built-in charger and automatic change-over to external 12 vdc battery if AC power fails. Automatic power output reduction for excessive SWR or PA overheating. Crystal for operating frequency not supplied. Manual included. Sold as-is without warranty. 19" x 5.22" x 17"D.
Scientific Radio Systems SR-204 AC power supply. Connects to SR-204 frame with 3 plugs and connections to fuseholder. Uses HP style power cord. Requires 3 amp or 1-1/2 amp fuses. SRS P/N: 204400. Scientific Radio Systems SR-204 DC power supply. Requires 25 amp fuse. Use Cinch-Jones P-2404-SB female on power cord to connect to power supply. SRS P/N: 204450. Scientific Radio Systems SR-370 solid state PA board and heatsink. A matched pair of SD1285 transistors in push-pull drive, 2 pair or MRF458 transistors in push-pull to conservatively produce 140 watts output from as little as 1/2 watt drive. Unit is broadbanded and covers from 1.69 to 30 MHz. External bandpass filters are highly recommended. Requires 13.6 vdc at 25 amps for full output. On board thermal sensors on the output transistors provide input to an external bias control circuit to reduce output power due to high temp and control an external fan on the heatsink (not included). Heatsink is 9-1/8" x 4" x 1-5/16" - PC board adds 7/8" to thickness. Manual included. Includes filter. Transistors alone are over $200. Scientific Radio Systems band pass filter board for RF amplifier (left). This circuit board contains 6 bandpass filters to reduce harmonic output. Each filter is relay switched by grounding the appropriate line. This board also includes RF output voltage and current sensing to detect SWR variations. As the output SWR diverges from 50 ohms, it is evidenced by output voltage and / or current changes. As a result, the bias on the final transistors is adjusted to reduce power output. Similarly, the output transistor case temperature monitored on the PA board is also used to control an external cooling fan and adjust the bias as needed. Supply voltage changes are also an input to this bias control circuit to reduce power output as supply voltage drops so that the output stage remains linear. There are also 5v and 8v regulators on this board for various uses in the original radio. Manual included. Circuit board measures 12" x 7" x 1-3/4". 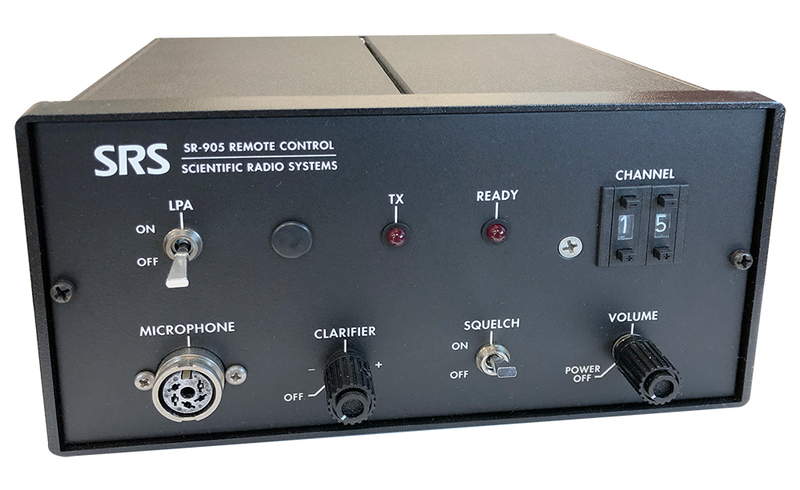 Scientific Radio Systems SR-1600 remote control. 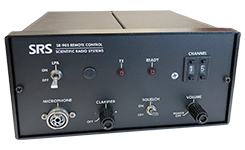 Provides local receive audio and couples local microphone audio to a remote transceiver via 600 ohm balanced lines. Includes a local microphone pre-amp and internal 4 watt audio amplifier and speaker for receive audio. Grounding the key-line switches from receive to transmit and switches the front panel indicator lights. Rear panel connections for external transmit audio and external speaker. Operates on 115 / 230 vac. Plenty of 12 DC available to power other devices. Old style 6 pin microphone connector on front panel. Button style spring clip mic holder on side. Includes manual. Dimensions: 8-5/8" x 5-3/4" x 7-5/8"D.
Scientific Radio Systems SR-AR131 forward and reflected power meter. Designed for 400 - 550 KHz, operates well into the HF range. 0 - 15, 0 - 150 & 0 - 1500 watt scales for forward and reflected power. "UHF" connectors on back panel. Includes manual. Dimensions: 7" x 3-1/2" x 3-3/4". The Selective Call Unit is an encoder / decoder designed for operation with radio communication networks. The unit encodes signals for paging individual stations or the entire network. The unit also decodes incoming signals to determine if the station is being called. The unit is also equipped to alert the operator to incoming calls, display the calling station's ID code, acknowledge the receipt of a valid code and provide the calling station a verification code. The unit can interface to land line or radio links. This unit may be used for protected access to remote control receivers for repeaters or remote base stations. It can also be used as a selection control encoder for multiple receive locations. Up to 256 Unit IDs may be programmed. The Sending Unit ID is preset on an internal circuit board. The Called Unit ID is selected by front panel thumbwheel switches. Upon receipt of a valid call the ID of the calling unit is displayed on the front panel LED display, an internal buzzer sounds, a dry contact closure is available on the rear panel and the "CALL" LED lights. At this point an automatic response confirming receipt of the call may be sent out on the control link to the originating station. An internal jumper may be set so that the response is only sent when the "CALL BACK" button on the front panel is manually pushed. The units are designed to be reset after a call only by use of the manual front panel push-button switch. The reset is accomplished by momentarily grounding the reset line. The dry contact closure may be set by internal jumper to "timed" or latch mode. In latch mode an external 'reset' pulse would be necessary to release the relay. This could be implemented by a special code sent to the repeater controller that causes the 'reset' pulse to be sent to the Selcal unit, thereby un-latching the relay. An alternative is to use the timed mode of the relay to start a timer which allows audio (with control tones) to get to the repeater controller and upon timeout the line is disconnected and the reset code is sent back to the selcal. Selcal units operate from 120 / 230 vac or 12 vdc at 1 amp. Requires HP style AC cord with 3 round pins or coaxial connector for DC operation. Internal switch and jumpers select input power requirements. Size 5-1/2" x 19" x 14" deep (rack mount). Rack mount frame may be removed to make unit 5-1/2" x 8 1/2" x 14". Internal plug-in cards are accessed by releasing the screw latch and swinging open the hinged, front panel door. Complete manual for the unit is included with each order. SR-380 complete front panel with all electronics. New from the factory. SR-380 front panel for SRS SSB Transceiver. Brand new!! The SR-700 Remote Control System is designed to control a transciever from a remote location of up to three miles with only 2 wires. The system also has an intercom capability allowing an operator at either location to ring a bell or light a lamp at the other location and talk with the operator at that location. The SR-700 Remote Control System consists of two units. The local unit (SR-700L) is located at the transciever location. The remote unit (SR-700R) can be located anywhere within 3 miles of the transciever. Both units contain a magneto generator for signalling the other unit and a light and a bell for receiving the signal. Batteries (1 D cell per unit, not included) are contained in each unit to power the handsets for intercom use if external power (12 vdc) fails. The local unit contains an audio amplifier for increasing the audio signal from the transciever to a nominal 0dBm at the remote location. The local unit also contains a constant current power supply to power the local and remote handsets. The keying relay and its drive circuit, which are located in the local unit, senses a handset closure in either the local or remote unit and keys the transciever. 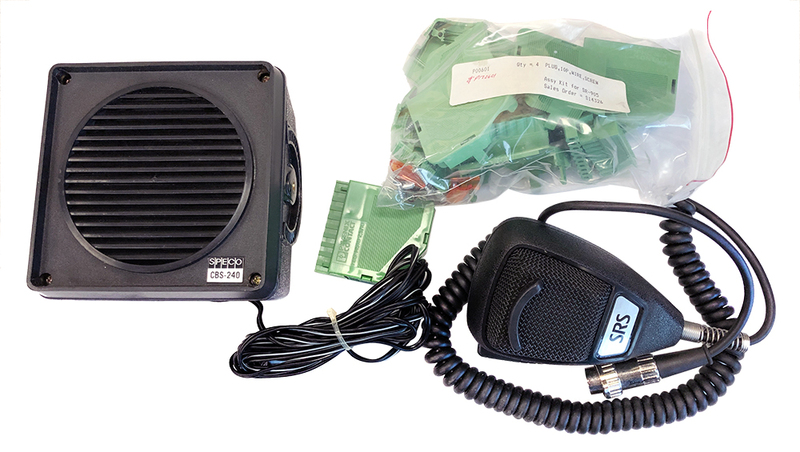 In addition to the circuits used for intercom and remote voice operation of the transciever, the remote unit has provisions for the sending and receiving of TTY signals. Both the local and remote units are housed in splashproof metal cases. Handsets and manual included. 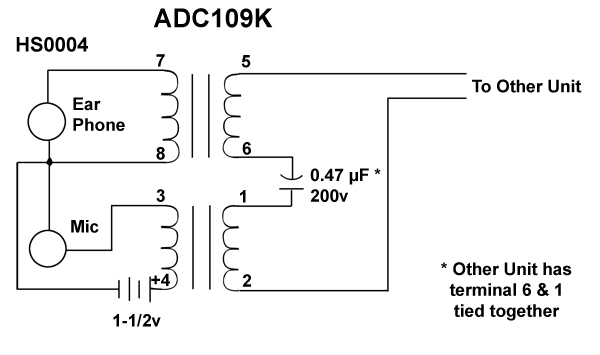 ADC dual transformer used in field telephone set. Compatable with our (TEL) HS0004 handset. Add a 1-1/2 volt battery and you have 1/2 of a 2 wire field telephone set. Solder lug terminals threaded stud mount on 2-1/2" centers. 3-1/8" x 1-3/4" x 3-7/8". SRS P/N: 700034.